Want to join a team that is mission-driven, mission focused, people-centered, and works to develop your skills as a professional? 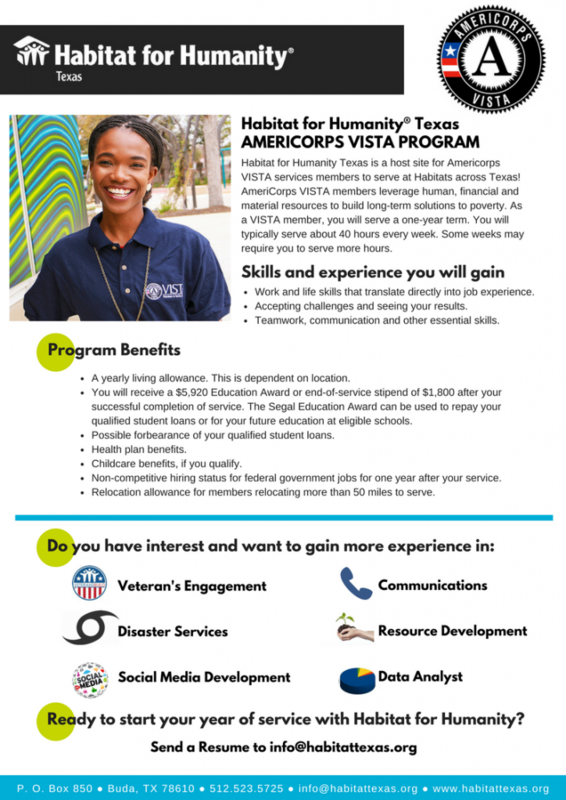 AmeriCorps VISTA and Habitat Texas might be the answer! We have positions beginning in July 2018 in marketing, veterans engagement, data analytics, policy development, journalism, website development, grant writing, fundraising, and more. This is a great opportunity to serve while gaining experience for careers in nonprofits, government, or business. Members will be located primarily in the Austin area with satellite placement in Killeen, Longview, Abilene, Houston, and Waco. Good team spirit, writing, and organizational skills are a must. Bachelor’s degree required. For more information on VISTA, click here. VISTA stipend plus small housing allowance from Habitat. Want to know more? Email Andrea at info@habitattexas.org. Deadline to apply is soon! VISTA members serve a one year term that begins immediately following their VISTA pre-service orientation. Our program year typically begins in August. Members may serve up to five VISTA terms, but are only eligible for two Education Awards. A typical week of service is about 40 hours. Some weeks may require more hours. VISTA service is considered a “24/7” commitment. As such, members may not hold another job while serving. They can, however; take educational courses with approval. Satisfaction of making a difference in your community and country. Work and life skills that translate directly into job experience. The personal satisfaction of accepting challenges and seeing results. Teamwork, communication and other essential skills. Monthly living allowance ranging from $973 to $1,650. Note that it is determined by the service location and is subject to change. Most locations are on the lower end of this range. $5,775 Education Award with a lifetime maximum of two awards or end-of-service stipend of $1,500 after the successful completion of service. The Segal Education Award is good for seven years from the completion of service and can be used to repay qualified student loans or for future education at eligible schools. Learn more about the Segal AmeriCorps Education Award. Possible forbearance of qualified student loans. Note that interest continues to accrue. However accrued interest on qualified loans is eligible for payment by the National Service Trust. Health plan benefits. The plan is not insurance and does not meet the requirements of the Affordable Care Act. Members who are not legally exempt from maintaining health care coverage are expected to have primary health care coverage outside of VISTA. The plan benefits provide support to existing coverage to supplement some of the out-of-pocket, non-premium, costs of a plan that is secured on your own. Learn more about VISTA healthcare options. 10 personal and 10 sick days. Childcare benefits if you qualify. Learn more about our childcare benefits. Non-competitive hiring status for federal government jobs for one year after the member’s service. While in service, VISTAs may have outside employment or attend school only with the authorization of their host site. Employment or school hours cannot conflict with the full-time service schedule. Upon completion of your service, you will become a member of the Habitat AmeriCorps Alumni Association. Visit the Habitat AmeriCorps Alumni Association for more information about benefits and opportunities. Contact Andrea Earl at info@habitattexas.org. Mission Driven: Believes in Habitat’s mission and values and consider them as a framework for all professional decisions. Entrepreneurial in spirit, relentless in drive to succeed for those we serve. People Centered: Initiates and advances the development of a variety of stakeholders to impact and strengthen the community. Communicates to engage and inspire people within and outside Habitat to create a fun, productive, uplifting environment. Our stakeholders are affiliates, the homeowners they serve, and the people of Texas with a stake in high-quality homeownership for all. Results Oriented: Dedicated to achieving the goals of the Habitat Texas program to ensure the necessary people and material resources to fuel the delivery of the mission. Development Focused: Committed to ongoing personal and professional development, striving to stay current with best practices in nonprofit governance and professional development and a commitment to the entire Habitat Texas team to make sure we, as individuals and a team, reach our potential.